BETTER BLUEBERRY PLANTS. REAL BERRY FARMERS. Lowest Plant Prices. 32 Varieties. All Sizes. Shipping Now. Our 103 year-old family blueberry farm and organic blueberry plants nursery grows the best certified blueberry plants the old-fashioned way. DiMeo’s ultra-premium blueberry plants grow larger, way better tasting blueberries. We can ship large ORGANIC, Non-GMO, Heirloom blueberry plants direct to your door for less. Ready to Fruit this Summer 2019. Stop overpaying for expensive tiny half-pints of blueberries. Grow your own organic blueberries and save money. We have over 88,000 likes with happy customers on our Facebook page. If you pick-up, we can sell you up to 4' ft. tall, BIG 3 year-old organic blueberry bushes for only $10. ORDER NOW in Mid-April to guarantee low sale pricing and inventory availability. We ship when you are ready to plant in April or May. There is still plenty of time left to plant due to cold winter we had this year. 1.5 Year-Old Blueberry Plants (only $1.95 each) (minimum 50 per order) these are multi-branched, established beautiful plants. You can plant them directly out in your field, patch, or easily pot them up to get them more established into large bushes first before you ground plant them. Shipped farmer-direct to your door when you are ready to plant this April or May 2019. You can start off with 600 plants (1/2 acre) to 1,200 plants (1 acre) or whatever amount you are comfortable starting out with. It’s up to you. It's no wonder all types of blueberry gardeners, growers and lovers from all across America choose DiMeo blueberry bushes. DiMeo Farms has over 88,000 likes with happy customers on our Facebook, just like pre-retirement and retired couples who call us to buy plants when they hear how great DiMeo blueberry plants really are. We help them start their own little blueberry patch so they can learn how to sell fresh, healthy locally grown Organic, Non-GMO, Heirloom blueberries direct from their own little roadside fruit stand, farmers markets, CSA programs or u-pick blueberry farm, to generate substantial retirement income during retirement years with our ultra-heavy bearing DiMeo blueberry bushes yield more pounds of giant, quarter-size blueberries. You can easily do the same thing for your family by investing in blueberry plants and putting your land to work for you. Direct-retail organic blueberries, sold by the pint, can generate yearly income of up to $50,000 per acre. Enjoy BIG, tasty blueberries that our Organic, Non-GMO, Heirloom blueberry plants can grow for you. Our large, multi-branched, ready to fruit this Summer 2019 blueberry bushes are ultra-heavy bearing. Only $10. Our customers have said "no other blueberry plants grow as vigorous or yield as many pounds of blueberries like DiMeo blueberry plants”. One of our DiMeo farmers can ship you a nice mix of early, mid and late-season variety blueberry bushes so you can pick blueberries all Summer long this 2019 for #1) nice extended blueberry harvest season #2) good cross-pollination for increased blueberry production-yield #3) bigger quarter-size blueberries #4) more tasty blueberries #5) better flavorful blueberries #6) most popular and productive varieties. Watch below video of SUPER-HARDY, ultra-heavy bearing large blueberry bushes that were shipped out to one of our happy DiMeo Farms customers, who said he wants to start his own little organic blueberry winery. We made him a really great wholesale blueberry plants deal on these super-size mature blueberry bushes which gave him an instant return on his investment in growing blueberries and yielding more pounds of blueberries per acre. This is why we are America's most popular choice for the best ULTRA-HEAVY BEARING blueberry plants for sale direct to backyard home berry plant gardeners, edible fruit tree landscapers, berry plants nurseries, speciality fruit wineries and start-up u-pick blueberry farms. You are investing in blueberry bushes that can grow blueberries for generations and generate substantial additional income in this high-demand market for locally grown organic blueberries. Call now (609) 561-5905 to get a fast April or May 2019 shipping quote or pick-up at the farm. Look at these beautiful giant bearing blueberry bushes ready to be shipped. We are an old-fashioned family blueberry farm that cares about getting kids into berry gardening and eating healthy diets. It's fun, plus it teaches kids where their food comes from and why they should eat organic foods. Call now (609) 561-5905 to get a fast quote, then we can give you easy instructions on how to order blueberry plants online or any of our other mail order berry plants. We prefer telephone calls so we can get all your questions answered quickly. Now you can learn how to grow the best tasting organic blueberries with the best, ULTRA-HEAVY BEARING blueberry bushes on sale. We have backyard berry gardeners from all across America who call us not only for expert blueberry planting tips but to buy higher yielding blueberry plants direct from our family blueberry farm. These happy customers drove hours just to buy blueberry bushes direct from us. If you live too far away, no problem, we can ship our DiMeo blueberry plants direct to your door for less. The DiMeo blueberry farming family has an average of 1,200 blueberry plants per acre. We have helped all types of blueberry growers and blueberry gardeners start growing healthy organic blueberries in their own backyard berry gardens. Many of these families also intend to sell blueberries that are at their own little roadside fruit stand. Many of our DiMeo Farms customers have told us that last year in Summer of 2018 they sold organic blueberries for up to $6.00 per pint. 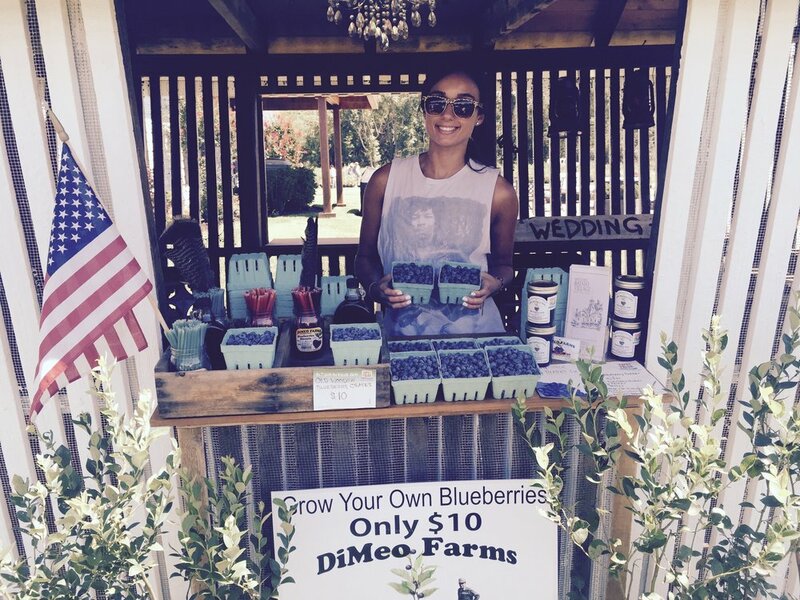 Start selling organic blueberries from your own little u-pick blueberry farm market stand like our roadside fruit farm stand that we used at the Hammonton Blueberry Festival. Our DiMeo blueberry farm market and New Jersey blueberry plants nursery was featured again in The Press of Atlantic City as shown here with photo and article. Where we sell fresh locally grown Jersey Fresh blueberries and other healthy Organic, Non-GMO, Heirloom blueberries. Below is an example of what you can start doing in your community with your own little roadside fruit stand to start selling Organic, Non-GMO, Heirloom blueberries and generate additional income during your retirement years. This is also a great investment idea for baby boomers retirement since you can plant 600 blueberry plants every Spring and Fall planting seasons. You don't have to plant your entire farm start-up project all at once. Take little steps in the right direction. We can help you get started. Just give us a call now (609) 561-5905 for blueberry expert advice. Did you know that you can make up to $50,000 an acre, per year selling organic blueberries off your land. That's with 1,200 blueberry bushes per acre, spaced 2.5' feet apart and 9' feet between each blueberry row. This is why so many of our happy DiMeo Farms blueberry plants customers from all across America are planting pick your own blueberry farms to prepare an retirement income plan with this great baby boomer retirement income strategy idea. There are few investment ideas that will give you a good return on investment in this current economy than investing in blueberry plants to start your own u-pick organic blueberry farm, featuring locally grown organic blueberries, which are in high demand. Both blueberry and food prices will continue to rise. You've seen the expensive supermarket prices for organic blueberries. This happy DiMeo customer took his daughters to buy plants from DiMeo Farms after they heard about us. Listen below to our fourth generation DiMeo blueberry farmer discuss how to properly plant and space blueberry bushes. This is the correct blueberry plant spacing that you should use for your u-pick blueberries farm because planting blueberries bushes farther apart will not improve your organic blueberry yield production per acre as some people think it will. Some think if they space the blueberry bushes farther apart, it will let more sunlight or air in around the blueberry bush and therefore, lead to an increase in blueberry yield. Unfortunately, this is a myth. It's an old way of thinking that old time blueberry farmers and growers did years ago. Today, modern blueberry farmers space 2.5' feet between each blueberry plant which is maximizes use of your land without compromising blueberry yield or production. Plant your own u-pick organic blueberry farm with DiMeo Farms & Blueberry Plants Nursery in New Jersey who has helped families from all across America start growing organic blueberries with our ultra-heavy bearing SUPER-HARDY blueberry plants. Smart families are growing fresh market locally grown organic berries as a second income or a future pick your own organic blueberries farm business for their children or grandchildren's future. Most families plan to sell fresh, healthy organic berries with powerful health benefits and nutrition, at their local farmers market. Start pick your own blueberry farms for a profitable PYO blueberries farm business with a little blueberry patch just like this one below with just 600 blueberry plants for a fast u-pick organic berry farm start-up. Then, every spring or fall you can easily add another 600 plants. That is exactly what this smart U.S Army military officer had in mind when he drove hours just to buy blueberry plants direct from us. He not only has strong military discipline, but he is a man with a good, solid retirement plan. He invested in his future retirement years with a great retirement investment idea that will give him years of additional retirement income with his selling fresh locally grown Organic, Non-GMO, Heirloom blueberries to restaurant chefs in the city who want to buy direct from local blueberry growers. He invested in DiMeo blueberry plants and wants to plant 600 blueberry plants (1/2 acre) every spring and 600 berry plants every fall planting season to prepare for his future retirement years with his own little pick your own organic blueberry farm and little roadside farm stand that will pay back dividends every summer. Our ultra-premium blueberry plants can thrive in hot summer heat down in southern blueberry growing zones up to 120(F) and are super cold winter hardy for northern blueberry growing zones down to minus -30(F) up in growing Zone 3. DiMeo blueberry bushes are so cold hardy that customers drive down from Canada just to buy blueberry plants direct from our NJ blueberry farm. Our DiMeo family's farm has large mature blueberry bushes that are over 60 years-old and still yielding pounds of giant blueberries. When you order our ultra-heavy bearing DiMeo blueberry plants from us, we can hand-dig them from one of our New Jersey blueberry plant nurseries and then prepare them for shipment like we did in this photo below, when fourth generation DiMeo blueberry farmer insisted the truck drivers wait until he double-checked the order before it left Grandpop DiMeo’s farm. Below is third generation blueberry farmer Mike DiMeo, Sr. who was at our blueberry plants nursery in spring (the plants were just starting to leaf out) and he helped our "home grower" blueberry gardening customers load up some DiMeo blueberry plants. Farmer DiMeo was happy to give free farmer-direct blueberry planting tips and advice. When you become a DiMeo Farms customer, you can consult with an expert DiMeo blueberry farmer for at no cost. We can give all of our customers free blueberry planting instructions, gardening tips and blueberry growing advice. Our DiMeo blueberry farming family is blessed with amazing health and longevity. So the DiMeo's have great longevity from healthy farm living and eating organic foods grown in the NJ Pine Barrens. 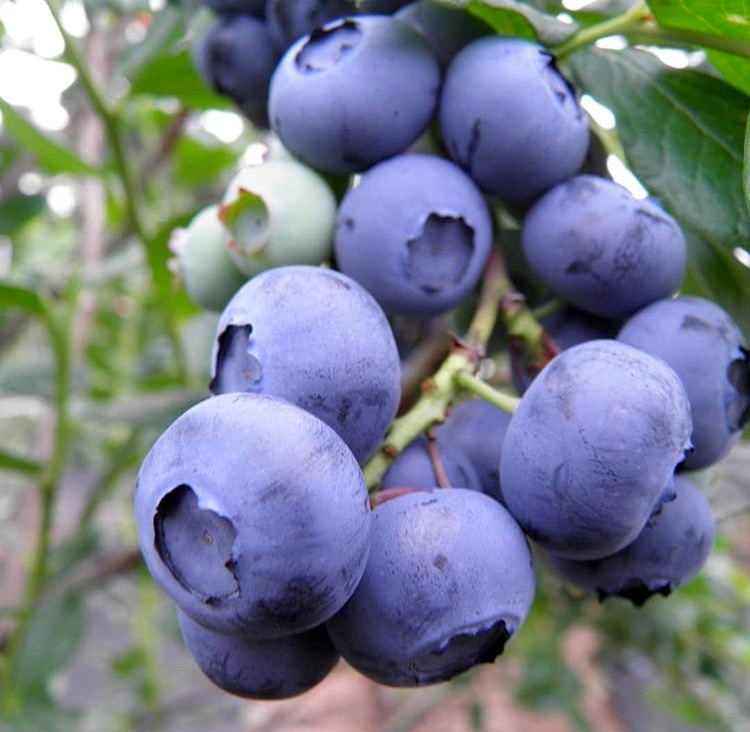 We sell super-hardy blueberry bushes and one of the largest blueberry plant variety selections of ultra-heavy bearing size blueberry plants and other super healthy berry plants for sale at our New Jersey family berry plant nurseries. Many blueberry growers that buy DiMeo blueberry plants report exceedingly high survival rates and exceptional blueberry plant vigor. People from across the world fly to DiMeo Farms to meet with our farmers and learn how to grow organic blueberries using our old-fashioned blueberry growing methods with ultra-heavy bearing DiMeo blueberry plants that can yield more way pounds of tasty blueberries. Call now (609) 561-5905 to get a fast April or May 2019 shipping or pick-up quote and ask all your blueberry planting questions. DiMeo Farms sells the highest quality blueberries and blueberry bushes for sale, highest yielding blueberry plants for all types of blueberry growers of every size. Our super-low $1.95 blueberry plant prices for beautiful starter blueberries plants is the best and lowest plant prices in America. We can recommend the most popular and productive blueberry plant varieties that we have tested and found to be the most productive blueberries bushes. This way, you never have to overpay for expensive blueberries at the supermarket. 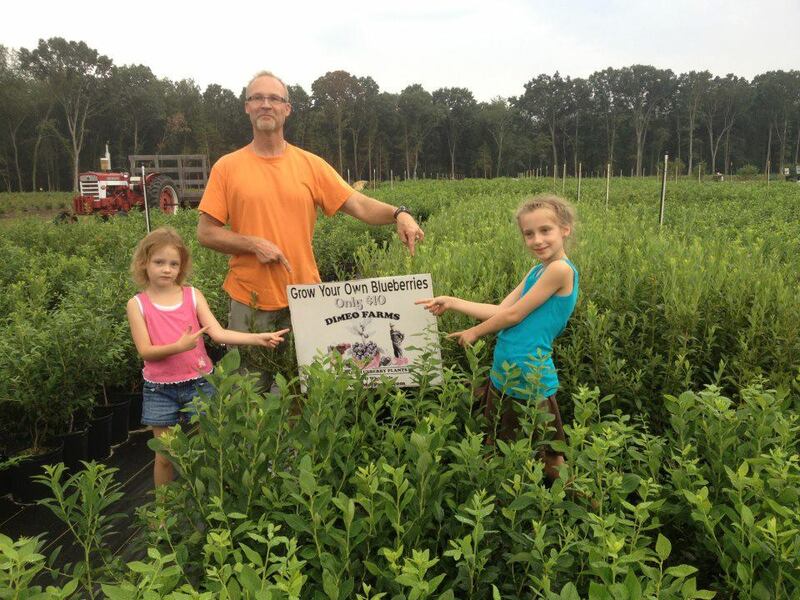 Just like this smart family from New York who drove hours just to buy blueberry plants from our family blueberry farm. Below is third generation Farmer DiMeo, Sr. digging blueberry plants for a wholesale blueberry plants customer order. We can hand-dig small home blueberry garden orders for home blueberry gardeners and edible landscapers, but sometimes machine dig larger wholesale blueberry plants orders. The video below was taken during fall blueberry planting season when the blueberry plants were going dormant and had already lost up to 60% of their leaves. Remember, you can plant now in April or May 2019. We take orders all year-round so we can secure your order based on our inventory availability which can change frequently. We recommend you call to order blueberry plants ahead of time. We can ship when you are ready to plant. Buying blueberry plants direct from real expert fourth generation DiMeo blueberry farmers with substantial blueberry acreage instead of just those online sellers, who are just growing berry plants in plastic nursery pots in their backyards or on a tiny piece of land that is not an actual real blueberry farm. Many of these plant peddlers are selling greenhouse planted and tissue culture grown blueberry plants that simply lack overall plant hardiness. This is why many of them won't make it through the first winter after you plant. Or how about the online plant sellers who pretend to be farmers, but are just peddling plants online without having any real blueberry farming experience or history. Anyone can sell plants online but we have over 100 years of history in growing blueberries in the American blueberry industry. We grow better blueberry plants the old fashioned way. Our DiMeo blueberry plants are not unnaturally made some lab or greenhouse from tissue culture. Did you know that up to 90% of our online competitors buy (to re-sell) slow growing tissue culture blueberry plants in bulk from large berry plant nurseries who unnaturally propagate those blueberry plants in a lab. It's true. Many of the blueberry plants for sale online or sold in big box stores such as Lowes, Home Depot or WalMart are all unnaturally made in a lab or greenhouse facility. They go from a propagation lab facility, to a greenhouse where they "push the plants hard with heat all winter long" and in a strict temperature controlled environment to unnaturally accelerate the plants growing cycle so they can turn over a quick profit. Then, the plants go from a greenhouse to a big box store like Home Depot or Lowes online blueberry plants to your house. When you plant them outside, many of the plants will not survive the first winter or grow vigorously, because they are not COLD-HARDY blueberry plants. Before you purchased them, they never saw the light of day or the actual sun. Others show you a low plants price, but they never tell you the actual SIZE or AGE of the plant. Most will ship you just a "little twig in a box" like this customer below customer experienced. She said she was "tired of getting stick plants" shipped to her from online mail order plant sellers so she decided to take her son to our family blueberry farm to tag the perfect blueberry bushes. Tissue culture blueberry plants can take twice as long to grow and just about any experienced blueberry farmer will tell you to stay away from tissue culture blueberry plants for this reason. Yes, they will look beautiful when you get them, but watch what happens when winter comes along, you will lose many of them and have to replant all over again. You won't find a single tissue culture plant lab facility or even a single greenhouse at the DiMeo's blueberry farm nursery. Grandpop DiMeo never liked raising blueberry plants in a greenhouse, because like he said, "those greenhouses make weak plants." Our 102 year-old family blueberry farm legacy and popular blueberry plants nursery has happy customers from all across America. Many buy our large blueberry plants or bushes shipped direct to their door. Some drive hours just to pick-up their order. Below are just a few photos and videos that are featured on our DiMeo Farms Facebook which has over 88,000 LIKES with happy customers who even send us love letters. Here's an actual video of us loading David's wholesale blueberry plants order for his shipper at our blueberry plants nursery in NJ. We gave him a great low price for his starter blueberry plants, and we can do the same for you just as we did for this happy DiMeo Farms customer. Notice how nice and healthy these blueberry plants are, with large root systems, so you can "really hit the ground running" with instant blueberry production, and start selling blueberries fast in your own community. All customer orders are different, with various plant ages, sizes, quantity and pricing. Give us a call (609) 561-5905 and speak with one of our farmers to get your pricing. Here's a video of Rob, a soon-to-be retired high school science teacher, loading starter blueberry plants in his trailer. He bought special rare heirloom blueberry plant varieties with the best tasting blueberries that his u-pick blueberries customers will love. He also plans on coming back to buy some aronia berry plants from us so he can make his own organic aronia berry fruit wines to sell along with organic aronia berries. He is going to add to his retirement income by selling organic blueberries at farmers markets and his own little roadside fruit stand. "The blueberry plants I purchased from the DiMeo Farms & Blueberry Plants Nursery are large and hardy, yet the prices that are so much less then any others I've seen advertised online. Hardy blueberry trees and detailed care for blueberries instructions were provided. Positive experience, as they were helpful with all my blueberry tree planting questions. I received great service and product. Thank you again." Here is an actual video of John and his wife's shipper picking up their DiMeo blueberry bushes order at one of Grandpop DiMeo's original blueberry plant nurseries with over 100 years of blueberry growing history. Look at how our DiMeo blueberry plants are sizable and super-hardy. These are higher quality berry bushes raised the old fashioned way. Watch and listen as we loaded up one of our repeat blueberry plant customers, just like John and his wife. If you are looking to buy organic blueberry trees, then you have found the best source. Remember that all orders plant sizes, and pricing is customized to each customer and their needs. Here's an actual video of us loading up Nicole and her husband at one of Grandpop DiMeo's original blueberry plant nurseries which is over 100 years-old. Lots of history here. They both drove over 9 hours up from North Carolina, just to personally visit our operation and buy our DiMeo blueberry plants direct from our popular berry plants nursery in Hammonton, New Jersey. They wanted SUPER HARDY and ULTRA-HEAVY BEARING plants with nice, well developed, healthy root systems that are all Ready to Fruit this Summer. An instant return on their investment. Call (609) 561-5905 and let us help you get started this April or May 2019. Here is an actual customer video, a retired police officer from Kentucky who was injured in the line of duty. He is working toward generating additional retirement income that will compliment his pension, by starting his own little u-pick organic blueberry farm in his rural community. He wants to sell locally grown organic blueberries direct at his local farmers markets and his own little roadside fruit stand farm market. He came to watch his shipper load his berry plants order and had a great DiMeo Farms experience. The video below was taken during early Fall planting season and the blueberry plant leaves were starting to change color, so that's why there is some leaf discoloration. Here's an actual video of us loading a blueberry plant order for the shipper at one of Grandpop DiMeo's original blueberry plant nurseries during Fall planting season when the plants were dormant and quickly losing their vibrant red colored blueberry leaves. Fall blueberry season is just one of many great times of the year to plant. Most customers plant now in April or May, but many berry farmers prefer to transplant, replant blueberry plants during the Fall season because of their busy schedules during the Spring. The plants show in the video below had already lost many of their leaves due to late fall season. We sell special blueberry peat moss for sale if you need to buy peat moss, even if it's just one (1) bale. Unfortunately, we do not ship peat moss, but, if you pick-up your order at our farm or blueberry plants nursery, then you can buy the best peat moss that your blueberries will love. This is a tractor trailer load of peat moss we got in from a long-time peat moss supplier that our DiMeo family has been doing business with for decades. Buy blueberry peat moss direct from us for the best blueberry root mulch. When you schedule your pick-up appointment, please let us know ahead of time so we can have it ready for you. Peat moss is the natural organic matter that blueberry plants love. We also sell special slow-release garden sulfur for sale, if you need to buy sulfur to lower the pH of your blueberry soil. Large 50 lb. bags are $40 each. Call to order (609) 561-5905. Did you know that organic blueberries are the most profitable berry per square inch of space in the produce section of a grocery store or supermarket? Would you rather continue to pay up to $5.00 just for a small tiny little half-pint of organic blueberries or grow them for free in your own backyard like these happy DiMeo Farms customers did on our Facebook with over 88,000 likes. People are tired of paying expensive grocery store prices for blueberries and would rather save money and grow their own organic blueberries without all the toxic cancer-causing fungicides or pesticides that most farmers spray on the fruit before blueberry harvest.